Police officials returned to the city council transportation committee with the same tired talking points. Police officials on Wednesday offered a simple response to City Council Speaker Corey Johnson’s five-pronged legislative approach to curbing rampant parking placard abuse by city employees: no, no, no, no — and, uh, also: no. Testifying before the city council transportation committee, NYPD Executive Director of Legislative Affairs Oleg Chernyavsky refused to endorse a single proposal in Johnson’s five-bill package to curb placard abuse — going so far as to diminish the extent of the well-documented problem. The council’s bills, however, would go further than de Blasio’s strategy by mandating specific enforcement steps from the NYPD. On that, Chernyavsky was crystal clear: Try again. And Intro. 1394 — explicitly prohibiting city vehicles from parking in illegal spots like bus lanes, bike lanes, sidewalks, and fire hydrants except in the case of “documented emergencies” — must be expanded to allow officials to park in those areas during “legitimate law enforcement operations,” he added. “The answer to placard misuse is one of enforcement and discipline, which continues to be done in significantly increased numbers,” Chernyavsky concluded, though statistics show only a six-percent increase in overall parking summonses issued last year from the previous year. 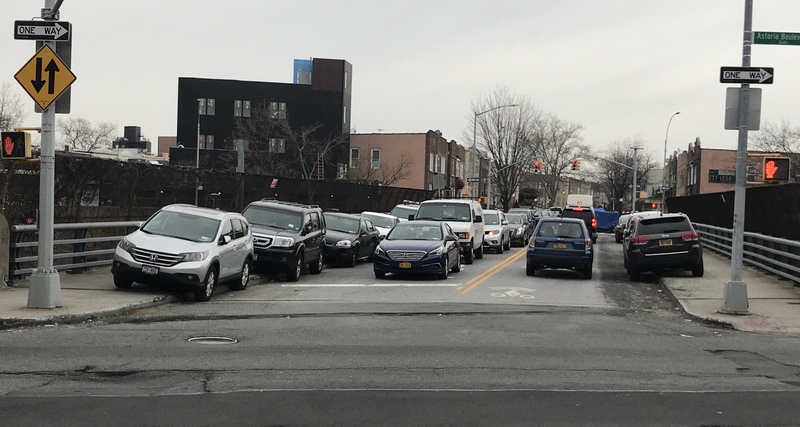 Other enforcement — such as the creation of an NYPD unit dedicated to parking placard abuse — has also yielded negligible results, and government employees continue to abuse their placard privileges all across the city. There are currently around 150,000 placards in circulation, which effectively allow placard-holders to park wherever they want, whenever they want. In response, Johnson noted the apparent ineffectiveness of NYPD’s enforcement efforts up until this point. The NYPD’s Wednesday afternoon testimony was a near carbon-copy of testimony Chernyavsky gave to the city council last June, in response to a different set of council bills aimed to curb placard abuse. In prepared remarks, advocates blasted the slow pace of progress towards address the scourge of placard abuse, which has been decades in the making. To soften the blow of losing their free parking, how about giving all NYPD staff a free citibike membership in perpetuity? The NYPD is so rotten and corrupt, that they don’t even pretend not to be. But then they would be forced by their captains to ticket themselves! Why does an agency such as HPD have the comply and carry out new laws with the City Council passes them, but an agency such as NYPD can just say to the law-makers? Why does NYPD not have to comply and adhere to new laws? Parking enforcement needs to be done by a private agency, to the police. And so what if they object on every level? We shouldn’t expect the police to make rational decisions about policing themselves, and we shouldn’t even try to win their support. The NYPD is incapable of getting on board with anything that results in a loss to themselves, so why not just take their opposition as a given and work from there? Instead of worrying what a bunch of halfwits who don’t even live in the city think about how NYC should be run. I literally spit on your stupid placards. Well maybe not quite literally. Windshield. Nah call the NYPD so they can overreact and accidentally shoot you and few of their fellow officers due to being trigger happy, terribly trained and having near zero accountability for their actions. Yeah or they can take the subway or bus like their underlings I mean the citizens they serve. This is simply a question of “who is in charge?” In a civilised society, the unequivocal answer would be the civilian government. But not here. In this town we are confronted with an overmilitarised police force that considers the civilian government irrelevant, and that operates in a manner indistinguishable from a military junta. Then who polices the police? This is what I don’t understand. Why can nothing be done about this clear out in the open corruption that the NYPD and other agencies openly ADMIT to? The mayor appoints the police commissioner, and so could appoint a reformer who makes it his business to clean the department up. This would surely face resistance from the rank-and-file; but the law presumably gives the commissioner the power to dismiss for insubordination those who defy his orders. The question is whether there exists any potential commissioner who has the will and the courage to make the changes that would be required to root out the systemic rot in that agency. And the answer to that question is “no”. However, when the State created the Metropolitan Police, the Municipal Police defied the order to disband; and there followed a period of chaos and even open conflict. It wasn’t until a Court of Appeals decision upholding the Municipal Police’s disbandment several months later that the absurd situation of two warring police forces was resolved. This suggests that the NYPD would simply ignore any State order for its abolition. (We must remember that the NYPD is a lawless body that answers to no one. The chilling truth is that this agency does not even acknowledge that it is subordinate to the civilian government; so the comparison to a military junta is by no means an exaggeration.) The State would then have the option of sending in the State police, or else standing down. Obviously it would do the latter — which means that the whole route of State action is a complete non-starter. So the short answer is that there is no answer. If the state does nothing if the NYPD defied a hypothetical order to disband the Mayor or Governor can declare a state of emergency, and ask Washington to send in the US armed forces. The NYPD won’t be defying them. They’re much better armed, and they’ll also treat the NYPD as enemy combatants if fired upon.